I love, love, love Polenta! Such an uncomplicated little gem, with its simplest form being nothing more than cornmeal that is cooked in water or broth until it thickens and the grains of the ground corn become tender. Italian in origin, with corn having made its way from the America’s to Italy in the late 16th century, polenta quickly became an important staple for Northern Italian peasants who often relied on it as a daily meal for the long winter months. Today we find a variety of polenta types: coarse-ground, finely ground, instant, white, and pre-cooked tubes found in the refrigerator section of larger stores. Once cooked, it can immediately be served soft with a silken, porridge-like consistency or, if left for a few hours to set up a bit, sliced and grilled, baked,or fried. Its versatility is truly endless. It can be used as a base for so many things; topped with roasted/grilled veggies, enrobed with a slow-simmered chunky tomato sauce, as an accompaniment for soups and stews, and even as an alternative to lasagna noodles and sandwich bread, but often the greatest pleasure of all is simply enjoying it with a rich slathering of butter and a liberal sprinkling of cheese such as this delicious polenta recipe shared by Jacob’s Kitchen (pictured above)! 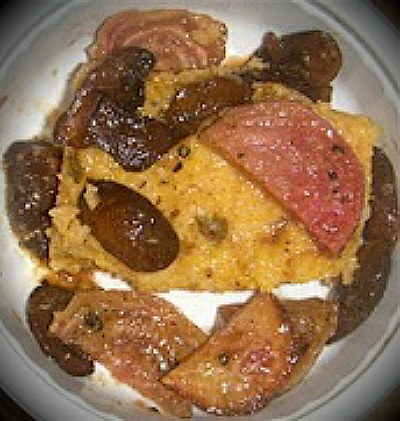 The recipe I am personally sharing with you today is one that I have adapted from Alton Brown’s Savory Polenta recipe. His recipe is my go-to recipe when making polenta since it is baked in the oven. This is a rather non-traditional method since it is usually made on top of the cook stove and requires more vigilant attendance. Indeed, I was a very happy girl when I stumbled across his recipe one day and gave it a go. The end result was all that I had hoped it would be and allows me to make a relatively quick and delicious dinner on even the busiest of days. It can also easily be given a different flavor profile by swapping out ingredients, such as using beef or vegetable broth (or water) instead of chicken, adding your favorite herbs and cheeses, etc. The list is endless! For this version, I am using chicken broth along with chipotle pepper and goat cheese. The creaminess and slight tang of the goat cheese, along with the smoke and heat of the chipotle pepper, really provide a delicious way to transform ordinary cornmeal into something elevated and truly tasty. If you have never before tried polenta, please give it a go. You will not be disappointed, as it offers a great change-up from pasta, potatoes, and rice. Buon Appetito! In a large oven-safe saucepan heat the olive oil on medium heat. Add the red onion and saute until they begin to turn translucent. Turn the heat to low and add the serrano chiles and garlic, saute for another 1 to 2 minutes. Turn the heat to high and add the chicken stock, bringing it to a boil. While whisking constantly, slowly pour in the coarse cornmeal, stirring until the cornmeal is incorporated and beginning to thicken slightly. Cover the pan and place in the heated oven. Allow to bake for 30 to 40 minutes until mixture is creamy, stirring occasionally to prevent lumps from forming. Remove from the oven and stir in the butter, salt, black pepper, chipotle chili pepper, and the goat cheese. Serve as is or spread into an 11 x 7 baking pan and refrigerate until firm. Once chilled, cut into desired shapes, brush with olive oil and either saute until browned or place on a grill. This tastes especially well the next day when the flavors and spices have had a chance to mingle. One of the ways in which I enjoy this is with roasted beets and sauteed mushrooms drizzled with my go-to vinaigrette (pictured above)… a great vegetarian recipe which I will be sharing with you in an upcoming post.